Who the Pot? Why so Primitive? The artifact preserved and cared for by the museumthe humble clay pot, for instancecommunicates a message to us through time about the circumstances of its use and how it got made in the first place. As Smith implies, Doyle’s works come with a built in conceptual dimension, and this distinguishes the work from clay pots understood to be straightforward executions of pottery as a craft. A nuanced understanding of how we exist in the present is a message the best artworks can bring to us. In Doyle’s case, the artist’s interest in mastering a centuries old technique sheds unexpected light on how we experience our contemporary world. Consider the words of Neil McGregor, director of the British Museum: [h]uman history is told and written perhaps more in pots than in anything else2for viewers of Doyle’s exhibition this includes what these pots can tell us about the history of our own time. Before making these works, Doyle thought it important she become a student of the craft of pottery in its earliest examples. Time spent at the Metropolitan Museum in New York, and especially looking at the Jomon pottery 3 at Tokyo’s National Museum was the artist’s starting point for the endeavor of pot making itself. Doyle’s exhibition plays with the conventions of museological display to make this context explicit. Fidelity to this source material also extends to the surface of the works, but more about that later. Up to this point Doyle’s art practice has not necessarily been craft-based. Instead the artist has embraced a range of strategies in which, more or less, form follows function for the projects she develops. For The Money Collection (2002-2003) Doyle collected money (donations welcome!) turning the necessity of financing her art practice into the substance of the practice itself. Existing mainly as an informational flyer and talking point, The Money Collection mined the humour of the humbled circumstances artists typically experience in the early stages of their career, the work proposing a way to make Doyle’s experience tangible for her audience. Instead of a medium-specific engagement, working longterm with sculpture or painting or video, for instance, Doyle creates the context for shifts in perspective she can share with her audience. For The Chip Bag Project (2004), the artist collected empty potato chip bags (her goal was to collect 10,000) with the idea they could be dropped from a helicopter en masse into Toronto’s Sky Dome (today known as the Rogers Centre), which she rechristened the Sky Bowl for the project. Seeing, with the help of the artist, a city’s sports center as a receptacle for our culture’s trashiest elements (junk food being much more pure commodity than actual food) helps us to break free, if only temporarily, from a normalized view of our culture in all of its ridiculous excess. The artist’s two Boulder projects take a similar approach to a wildly different topic: the erratic boulders that populate the urban landscape in Canadian cities. In short: erratics are rocks that have been transported by glaciers to wherever they have happened to come to rest. Launched by the artist in Toronto and Vancouver in 2004 and 2005, respectively 4, Doyle’s twin projects present two erratic boulders in their respective cities as sculpture. Positioning her boulders as artworks, Doyle then created booklets for each project that included a guide to where other boulders could be found throughout the two cities. Functioning incidentally or by design as elements in an urban landscape, these large rocks typically go unnoticed, blending in with their surroundings along with nearby squirrels and park benches. Doyle’s project asks us to look again. Contemplating how they got here suggests a glimpse into a geological timeframe that engulfs us, a corrective to a purely human and narrowly contemporary perspective on our everyday experience. Of course a long tradition exists within art making for this type of corrective. It is called the momento mori (remember that you will die). While other works by Doyle directly partake of this tradition (Bone Dump (2011), for instance, a commission by Toronto’s Nuit Blanche, consisting of 8000 femur-like porcelain bones piled in a heap), Who the Pot? could be said to evince similar concerns, if less directly. Clay pots are among the earliest examples of human culture. Recent scientific studies have found a connection between the skills required for tool making and human speech. For this reason, the earliest toolslike a hand axe carved out of stone, for instanceare considered to mark the emergence of humans most like ourselves 5. Sculpture makes society, in other words, and the works in Who the Pot? deliver this message in terms that are highly particular to the time we live in. Every potter, in practice, will make ceramics in a manner consistent with the craft’s prehistoric origins. 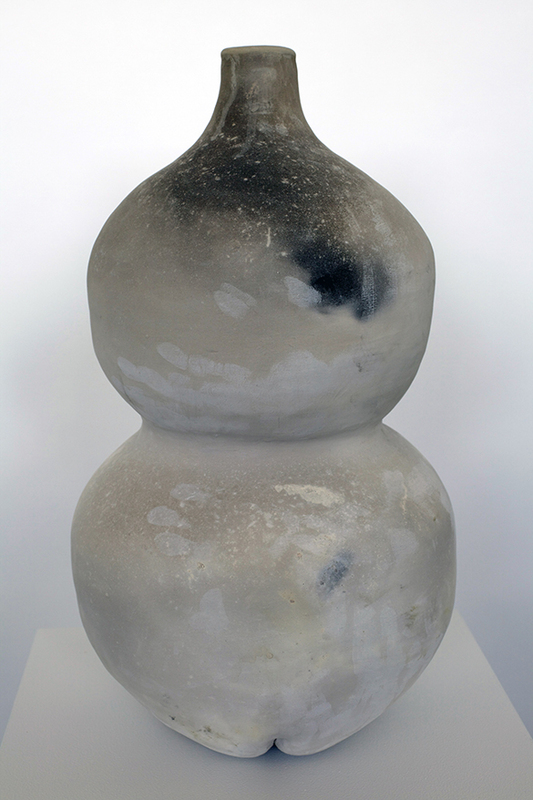 Doyle’s pots reinforce this idea; through the similarity many of her works have to examples of the earliest ceramics (the pot, the jug and the pitcher), their method of display, and most important: choices the artist has made about what the surface of each pot looks like. She has opted not to work with the glazed finish familiar from contemporary ceramics, (the glaze makes ceramics usable, unlike Doyle’s works). Fired by the artist in a barrel, the surface of each pot is instead sealed by smoke, the tell tale signs of which are the surface flashing marks of smoke and flame. This simple choice marks Doyle’s pots as decorative, but within a register of the prehistoric world. In their textured and imperfect surface, in the absence of sheen, we can intuit a kind of withholding on the part of the artist. She resists allowing her artworks to appear seamless with the universal surface of contemporary life. This would be a universal surface as it is figuratively understood, which is experienced through the lens of the digital. Against that depthless continuum, Doyle asks us to, if momentarily, look away so we might understand our lives within a broader and much more human, expanse of the present. 2Neil McGregor, A History of the World in 100 Objects (London: Penguin) 2010, 55. 4Maura Doyle, There’s a New Boulder in Town, 2004, Toronto Sculpture Garden, Toronto; Monument to all Boulders in Vancouver and on Planet Earth, 2005, permanent public sculpture in conjunction with Or Gallery and City of Vancouver. 5Neil McGregor, A History of the World in 100 Objects (London: Penguin) 2010, 17. ROSEMARY HEATHER writes about art, the moving image and digital culture for numerous publications, artist monographs and related projects internationally, including Canadian Art (Toronto), Border Crossings (Winnipeg), Art Papers (Atlanta), Flash Art (Milan), www.experimentalconversations.com (Cork), CACTUS (Toronto), Hunter and Cook (Toronto), www.apengine.org (London, UK), Von Hundert (Berlin), Daddy (Los Angeles), Neue Review (Berlin), The Senses and Society (Oxford), Art News (New York), BE (Berlin), and tema celeste (Milan), among others. Her ongoing project The Real and How to Find It interviews artists about the subject of The Real. Recent interviewees include Ken Lum, Kerry Tribe, Hito Steyerl, Phil Collins and Candace Breitz. A co-author of the collectively written novel Philip (Project Arts Centre, Dublin, 2006), exhibitions she has curated include: Screen and Dcor (Justine M. Barnicke Gallery, Toronto; Southern Alberta Art Gallery, Lethbridge; Illingworth Kerr Gallery, Calgary 2013-2014 ); Ron Giii: Hegel’s Salt Man (Doris McCarthy Gallery, Toronto; Art Gallery of Carlton University, Ottawa, 2006-07); Serial Killers: Elements of Painting Multiplied by Six Artists (Christopher Cutts, Toronto; Platform, London, UK); and I Beg to Differ (Milch, London, UK). From 2003-2009, Rosemary Heather was the editor of C Magazine (Toronto). Since 2012, she has worked as Director of Publications and Communications for Fogo Island Arts, Fogo Island, Newfoundland. An online archive of her writing can be found at: rosemheather.com. MAURA DOYLE holds a BFA from the Emily Carr Institute (Vancouver) and an MFA from the University of Guelph. Her multidisciplinary work includes video, ceramics, sculpture, book works, posters and drawing. Exhibitions include New Age Beaver, Modern Fuel, Kingston (2013), Garbologic Objects, Paul Petro Contemporary Art, Toronto (2012), Bone Dump, Scotia Bank Nuit Blanche Toronto (2011), Dedicated to you, but you weren’t listening, Power Plant, Toronto (2005), and The Cave and the Island, White Columns, New York (2004). She is represented by Paul Petro Contemporary Art, Toronto and lives and works in Ottawa, Ontario. The artist gratefully acknowledges the support of the Canada Council for the Arts and the Ontario Arts Council.